Today’s post will be a little different. It’s not actually about Jpop but this topic is something that’s very dear to my heart and I want to raise aware about so I very much hope that you’ll take the time to take a quick look at it even if it’s not Jpop-related! As a child, my favourite Disney princess movie was The Little Mermaid. To be honest, I’m not entirely sure what I liked so much about it. 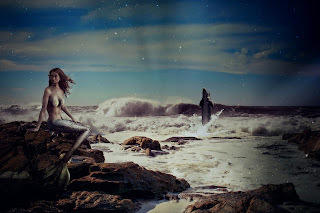 I was always captivated by anything magical, so maybe it was just the idea that these beautiful half-human, half-fish creatures could very well exist in our oceans and we had no idea about it. I’ve retained my love of mermaids (and mythical creatures in general) even into adulthood. I’m not ashamed to say my bedroom is full of mermaid trinkets, I own several decks of mermaid oracle cards, and I may or may not be brushing up on my swimming skills just so I can buy myself one of those swimmable mermaid tails. There is another reason why the story of The Little Mermaid has become very important to me though, and it’s not because I want to marry a handsome prince (although that would be nice)! The Little Mermaid tells the story of a young princess who falls in love with a prince. The one problem though, is that he’s human and she’s a mermaid. In order to become human so she can make her prince fall in love with her, she has to give up her voice. How is she supposed to do anything if she can’t speak though? How will she get the prince to fall for her? She can’t even order food for herself at a restaurant or tell someone if she needs some help. These are situations I know all too well because I had a condition called selective mutism. Selective mutism (SM) is an anxiety disorder which prevents a person who is physically capable of speaking from doing so in certain situations or to specific people. The sufferer will most likely speak freely and confidently at home, but may “freeze” in a situation they don’t feel comfortable in such as a new environment or around people they don’t know well. I was always pretty quiet as a child but I developed SM when I was about 11. I practically never spoke at all outside of my own house and I only really spoke to my family and friends I’d known for a long time. I had a difficult time at school as I often couldn’t ask for help when I was struggling, and many people thought that I was intentionally ignoring them so you can imagine I wasn’t very popular. I honestly felt like my voice had been stolen like Ariel’s except I wished I could just give up on any hopes I had of making friends and leading a “normal” life and just go back to living in the sea. Now as a 21-year-old, after many failed interventions and trials I mostly consider myself over SM. I still feel that my communication level isn’t where it should be and talking is still something I find difficult at times. Blogging has helped me a great deal, as it’s somewhat easier for me to get my feelings across via writing rather than verbally. There are a few people in my life now who I’d consider friends. I got my voice back from the sea witch but it wasn’t easy and there are still some lasting effects. October is Selective Mutism Awareness Month. If you’re feeling generous then why not donate to SMIRA, a UK-based SM charity who are dedicated to helping out all of the little mermaids and mermen (and even the not-so-little ones because SM doesn’t just affect children) out there so they don’t have to go through what I did? Also, if you’re interested you can check out my old blog where I wrote about my experiences with selective mutism here. Also check out Selective Mutism In Our Own Words, a book that I contributed to here! Feel free to share this post with the hashtag #SelectiveMutismMermaids to raise some awareness!